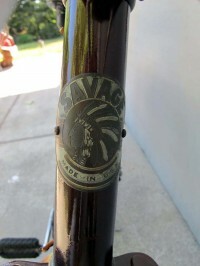 This is a post WWII Savage built by HP Snyder, Little Falls, NY, marketed by DP Harris and sold through an unknown retailer. 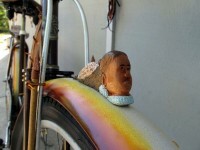 The bike is likely a late 1940s or early 1950s. 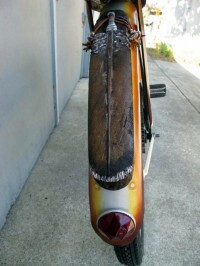 From the “as found” photo, it can be seen the bike was not a high end bike. The factory must have been building bikes as rapidly as they could to meet the post war demand for consumer goods. There were three paint runs in the original single color blue paint. 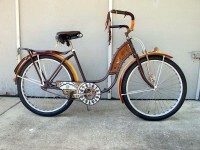 There were no second color highlights, pin stripes or other patterns on the bike. The brazed joints were very sloppy with several voids and brazing runs. 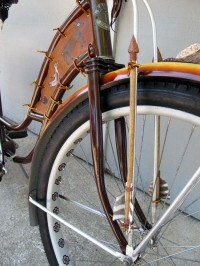 The most valuable item on the bike was the Savage head badge. 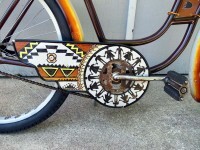 The bike was rebuilt on an American Indian theme, with emphasis on the Northern California Pomo Native American heritage. 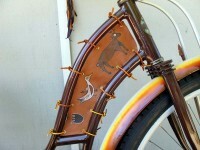 The home built chain guard is a series of images from Pomo woven baskets, for which this tribe is world famous. Included in this imagery are several Dau, or Spirit Doors, to allow good spirits in and to let evil spirits out. In place of a horn tank is a leather “blanket” with items significant in Pomo history and culture, including a bear paw, native birds, white tailed deer, Pacific Coho salmon, Tiger Salamander and a male Pomo in dance regalia. 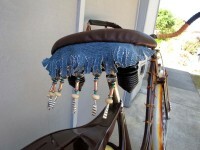 The back of the leather seat are bangles representative of the embellishments worn by female Pomo dancers. 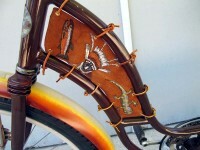 The Pomo maiden on the front fender and the dance feather on the rear fender were hand carved from oak, stained and painted.